Information shown here for each Society/Club includes; location of the library, postal address, and email address. 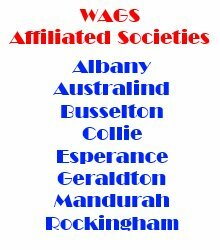 Some of the WAGS Affiliated Societies were formerly Branches of the Western Australian Genealogical Society who became Societies in their own right as of 1st April 2000. Some Affiliated Societies have closed down over the past few years, including: Carnarvon FHC, Goldfields FHS and Warren-Blackwood FHS. WAGS Affiliated Societies web pages and location maps are available via links in the menu items above, or the footer menus below.